Back to school is in full swing, the summer is fading giving way to colder nights, shorter days and of course there is football season. With the busy lives of families these days we all have our list of tasty quick and inexpensive dinner solutions. My family has Little Caesars on our grab and go list. Its tasty and so affordable, kids LOVE Pizza! 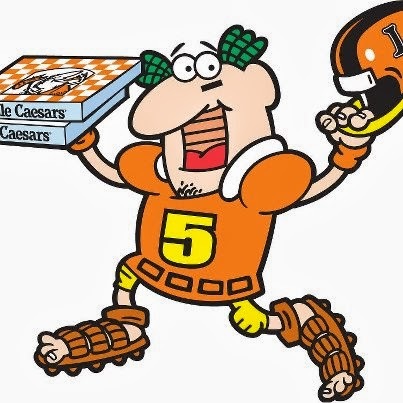 We know many families enjoy football games on tv and a great way to keep the kids entertained is by serving pizza during the game. My son can only be interested in a game for so long before he wants to watch cartoons but serve some pizza and bread sticks he is all about hanging out. Last week my family decide we would cheer up all the kids in our circle of friends by hosting a outdoor pizza party. We bought 4 pizzas and invited all the kids to the pool. I know they all miss the summer nights of swimming and playing since school has started. It was a nice way to have my son play with his friends and have a easy dinner that we all enjoyed. 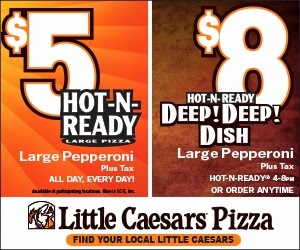 Little Caesars is an easy solution to a quick meal with $5 pizzas. You can find a location near you here. To help you have a night off and just serve PIZZA! 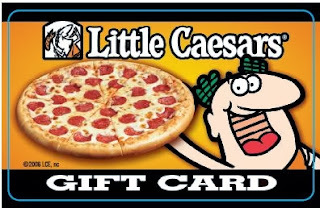 You can enter to win a $10 gift card to Little Caesars. 2 Winners will both win a $10 card. *Limited to US residents 18 years old and above. Giveaway starts Oct. 08 2013 and ends on Oct 25 2013 at 12:01 am EST. Winner will be emailed and has 72 hours to respond before another winner is selected. I was not paid for this giveaway or post. The opinions on this item are 100% mine and may vary from others. The sponsor is responsible for providing the prize. I was sent a product to review for this post. My soon to be husband, my parents and my kids! I'll share with my husband, son, daughter, son in law, granddaughter and grandson. I'll share my pizza with my sweetheart. My fiance & our kids. I'll share with my family. I wil share with my son. 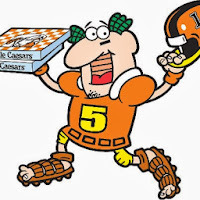 my boyfriend loves little Caesars - i'll share with him! I would share the pizza with my family! I will eat it with my girlfriend!! judy!! No one ... kidding ;). My parents and I love LC's pizza! This would be for the whole family. I would share with my husband. My child does not like pizza. Can you believe that? I'd give it to a family I know that is in need right now of a pizza pick-me-up. I will share it with my hubby and my 3 girls! Id give the gift card to my middle son, he loves Little Ceasers! I guess I could be nice and share it with the family! Have a nice pizza night. I will share with my kids and husband! I will share this with my niece. I would share it with my boyfriend and his daughter! My hubby and our roommate. I would share the pizza with my friend.